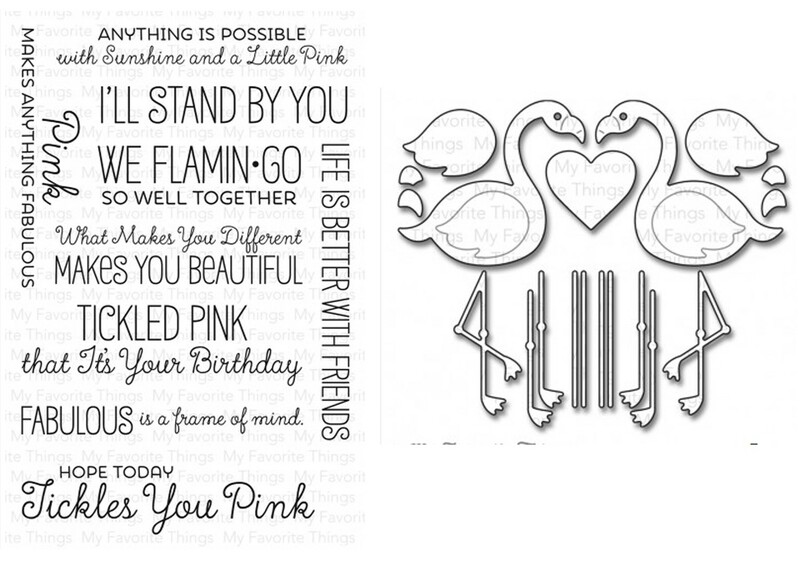 Fun and flirty phrases paired with words of encouragement and companionship featuring a trendy mix of fonts make the Tickled Pink stamp set from Laina Lamb Design perfect on its own but even better when complemented by the irresistible Flamingo Die-namics. This 9 piece set coordinates with the Flamingos Die-namics and includes the following elements: Anything is Possible with Sunshine and a Little Pink 3 ¼” x ½”, We Flamingo So Well Together 2 ¼” x 5/8”, Life is Better with Friends 3 ¼” x 5/16”. Are you tickled pink by Laina Lamb Design’s trendy Flamingos Die-namics? Two leggy birds mirror each other for lovey-dovey crafting opportunities. Position the included heart between the flamingos and add your choice of three leg options – one of which mimics the look of the ubiquitous and totally cheeky lawn ornament. This 12 piece set includes: Bird bodies (2) 1 7/8” x 1 ½”, Wings (2) 7/8” x 5/8”, Beak tip ¼” x 1/8”, Heart 7/8”, Crossed legs (2) 5/8” x 1 3/8”, Straight legs (2) ¼” x 2 ¼”, Metal legs (2) 1/16” x 1 ¼”.